I learned something interesting today. Returning from Bleecker St. to Riverdale, I used my senior MetroCard for the subway to Grand Central, then took Metro-North to Riverdale. Rather than walk up the long, steep hill in the cold, I boarded a waiting Hudson Rail Link bus. When I inserted my card, the fare box read "Transfer, Fare $0." So I got a free ride on the bus. 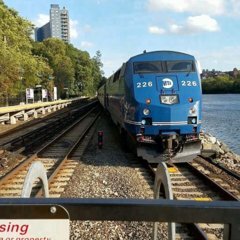 Later I found this on the MTA website: "When you use the MetroCard on the Hudson Rail Link, you get free transfers between the Hudson Rail Link and NYC Transit subways and buses." Yeah, always been that way. I’ve done that walk from the Riverdale station to Riverdale Avenue. Not fun. As long as you pay per ride has some money on it, free transfer from the subway. Anecdotally, I saw a farebox that said "1 XFer OK, $0 left" after the person dipped it, so hopefully they fixed that glitch. I dunno, but on the Hudson Raillink buses, when I have called myself using a pay per ride to finish it off before a holiday, etc and transferred with the last $2.75, it wouldn’t give me the transfer. The drivers know me so they would just waive me on, but still annoying, and I’m certainly not using a back-up or a new pass for that.